Churchill is now regarded by many people as one of the greatest wartime leaders of the century. However, many people may not be aware that Churchill, a noted statesman and orator, was also an officer in the British Army, a writer, a historian and an artist. In fact, he remains to this day the only British prime minister to ever have received the Nobel Prize in Literature, and he was also the first person to be made an Honorary Citizen of the United States. With an impressive background, it could be said that Churchill was always destined for greatness – however, very few people could have predicted his epic rise from political ‘wilderness’ in the 1930s to eventually take the lead in warning the nation about the intentions of Nazi Germany and in the campaigning for rearmament. Appointed First Lord of the Admiralty upon the initial outbreak of World War 2 – Churchill became Prime Minister following the resignation of Neville Chamberlain on 10 May 1940. Over the years to follow, his steadfast refusal to consider surrender, defeat or compromise made him a formidable figure – and perhaps the perfect leader for the nation during the early part of World War 2, when Britain stood alone in its active opposition to Hitler and Nazi Germany plans. 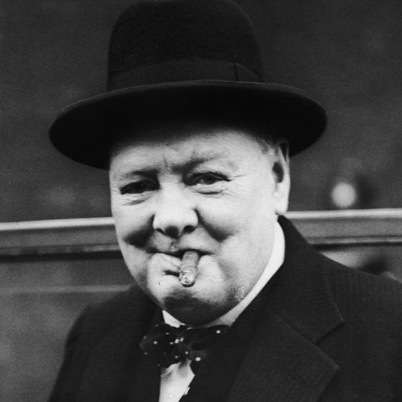 Perhaps best noted for his morale-boosting radio broadcasts and speeches, Winston Churchill led Britain as Prime Minister until complete victory over Nazi Germany had been obtained. Perhaps surprisingly, following Churchill’s pivotal role in World War 2, he was defeated in the 1945 election – however, he remained leader of the opposition for many years and continued to have a huge impact on world affairs. Then, in the General Election of 1951, Churchill held the office of Minister of Defence – a task that ran from October 1951 to January 1952 and in October 1951, he once again became Prime Minister. His second reign as Prime Minister ended in his resignation in April 1955. After leaving his position as Prime Minister, Churchill spent considerably less time as an active member of parliament until he eventually stood down during the 1964 General Election. As a “back-bencher” and advancing in years, Churchill then spent the majority of his remaining years at his home in Hyde Park Gate, in London. At this point, it was reported that Churchill suffered from depression as his mental and physical faculties began to suffer. However, one thing is for sure, Winston Churchill will remain a key figure in the events of World War 2 and his work over the years continues to be celebrated by many.